Prices have not changed: Most 1-gallon Clematis are $20 each (orange tags); 2-gallon Clematis are $25 each (orange tags, located on the terrace). Collector’s Corner plants are $40 each and located on their rack inside the greenhouse. Clematis coactilis: We begin the season with five specimens for sale, several in bud, and more to follow. Clematis coactilis is native to the shale barrens of Virginia, but has adapted well to our sunny Front Bank garden. 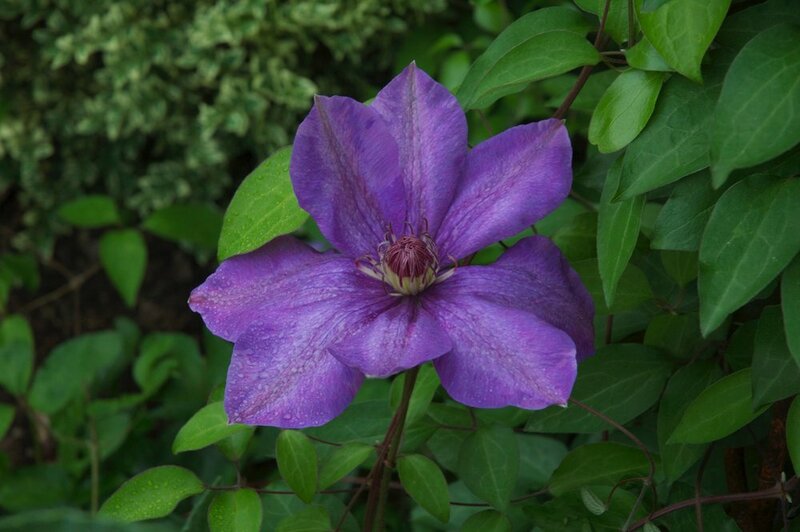 Clematis fauriei: We begin the season with one plant in bloom, and will have more later. Grown from seed from the specimen first acquired from Magnus Johnson. Clematis fauriei is in the atragene section of the genus, so good drainage and avoid hot afternoon sun. Native to the island of Honshu in northern Japan. 'Duchess of Waverly': Available later in the season. ‘Halina Noll’ was bred by Wladyslaw Noll of Poland. 'Maksymillian Kolbe': One plant available with more to follow. 'Maksymillian Kolbe' in its host shrub, Viburnum plicatum forma tomentosum 'Molly Schroeder'. 'Prins Hendrik': We begin the season with two plants and more to follow. 'Prins Hendrik' showing its fascinating texture. For reasons known only to itself, this flower only has five sepals. This is highly unusual—expect 6 to 8. 'Regina': We begin the season with two plants and more to follow. 'Regina' when just open. Fades gracefully to a lighter lavender when grown in full sun. 'Sharpie': We begin the season with one plant and more to follow. 'Sharpie' is a poor candidate for living in a container, where it becomes quite rangy. In the ground it is fantastic, as well as fantastical! C. texensis: We begin the season with two plants with more to follow. Clematis texensis, the red + red form, also known as the Tarpley River form. We believe the dark spots on the leaves are cellular damage from being watered on hot days. Maurice Horn at Joy Creek Nursery suggested this. Clematis vinacea: We begin the season with 8 plants. Clematis vinacea was originally misrepresented on herbarium specimens as C. crispa. They look nothing alike—the flowers of C. vinacea are much more tailored—and this plant does not want soggy feet. Average soil moisture is advised.